I heard about the Orpheum Theatre in Memphis. http://www.orpheum-memphis.com/ It has a long interesting history back to Vaudeville times. I am really curious to go inside because I would like to meet Mary, the Theatre ghost. She is a young girl ghost that has been seen there for more than 50 years at performances. I have never met a ghost before, and she is supposed to be nice. I wonder if I should wait by the door during a performance and maybe she would come outside during intermission. On my walk the other day, I saw a fire engine come very near my street. And then I looked and garbage pails were on fire! Thank goodness the fire department put the fire totally out before it reached a house. So I went over to say hello and thank them for their service protecting us from fires and saving people and animals. They are so brave everyday. I didn't meet the fire dog. I am in awe of dogs with that career. I wanted to see where the Memphis Grizzlies played basketball. So Mom & Dad took me downtown to see the FedEx Forum. Wow, it is a big place. And there was a really big basketball that was outside in front. I think it must have rolled out of the stadium. Judging by the size of that ball, they must be really big basketball players. No wonder they are called Grizzlies. Ever since Justin Bieber became a teen sensation, so did his hair. So it got me to thinking. What if I had that hairstyle? Would I too become a sensation? I guess my Mom could post a video of me barking. So maybe someone would discover me too. 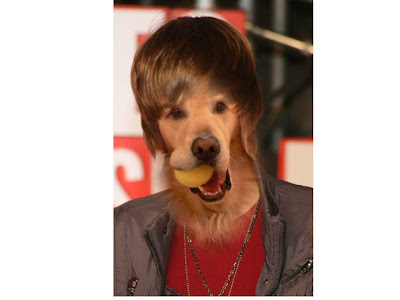 Justin Bearber? The other day I saw this big bright yellow bus. I had never seen one like it before, so I went over to look. It said InfoBus. So I thought this is a perfect resource for me. I always have so many questions about all things in life. I could just get on this bus and get all the info I need. It would make me feel so fulfilled, and so smart. Now all I need is a Library Card. I can't believe a year has passed since I started this blog! When I began, I lived in San Diego, so my posts were about California and lots of beach adventures. Then I moved to Tennessee in April (those were fun posts). My life in Memphis is quite different. Not only do I have a brother and a sister, I have been told I bark with a southern drawl (or is that drool?). To commemorate my blog's birthday, I will donate $1 for each comment left below on today's post through the end of this month. The comment needs to say specifically which has been your favorite post of all time on this blog. The donations will be given to the Memphis Humane Society. One comment per person please. My piggy bank is not that big! 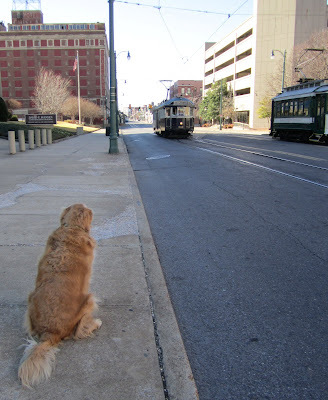 Memphis has these authentic vintage trolley cars that run downtown and stop at famous places. So I waited at a trolley stop. And there came the trolley. The trolleys are restored to their original elegance. So they are supposed to "invoke memories of the simple days of yesteryear." Well, I am only eight years old and my days aren't too complicated. But I did think the trolleys were real cool. Only problem, I was not allowed on. So I continued my sightseeing walk. Better for my weight watching new year's resolution anyway. Whenever I go on a golf course walk, I always find a stick, carry it around proudly, and then bring it home to put outside the door as potential firewood. 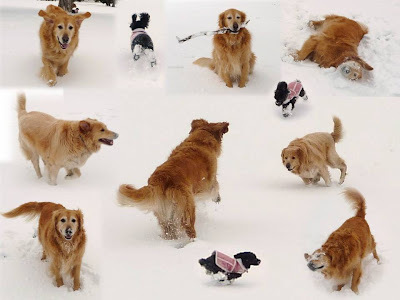 Well, the other day during our walk in the snow, I found a stick. But it was not one of my usual sticks, it was a Popsicle stick! It was so delicious that I decided to sit right there and have it rather than bring it home. Amazing, how snow creates a whole new world of discovery. My Dad had a great idea. When Mom goes out of town, he wants to make it Steak Saturday. 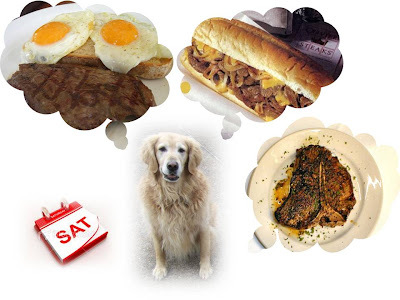 That would mean Steak n' Eggs in the morning, a Steak sandwich for lunch, and a Porterhouse steak for dinner. Mom overheard us and said she had a better idea. She suggested Salad Saturday. So now of course he will have to deal with Mom guilt if he moves forward with Steak Saturday. I have a feeling I will be smelling lettuce and tomato. Yesterday was a lucky day for me. Mom was getting our food ready. First she put Rosy's kibble in her bowl and placed it on the counter. Then she put Bear's kibble in his bowl. and put it down on the counter. Then as she was preparing mine, she made a klutz move and tipped Bear's full bowl over. JACKPOT! Before Mom could even reach for the dustpan, I, Fuzz the canine vacuum, cleaned it all up. I knew one day standing at attention next to Mom during feeding time would pay off. Memphis doesn't have a Major League Baseball team which I originally thought was a bummer. But then I learned about the RedBirds. They are the Minor league baseball team here and Memphians are very proud of them. 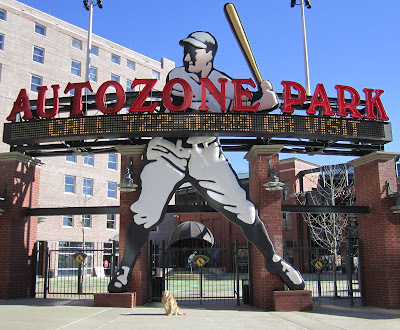 So since I now am a Memphian, I wanted to see where the RedBirds play . So Mom & Dad took me to see Autozone Park. But the Redbirds werent there. They will be flying back to their nest in April. Sometimes Rosy shows her teeth. When she does, Mom tells her "No!" I dont know why Mom has a problem with it. 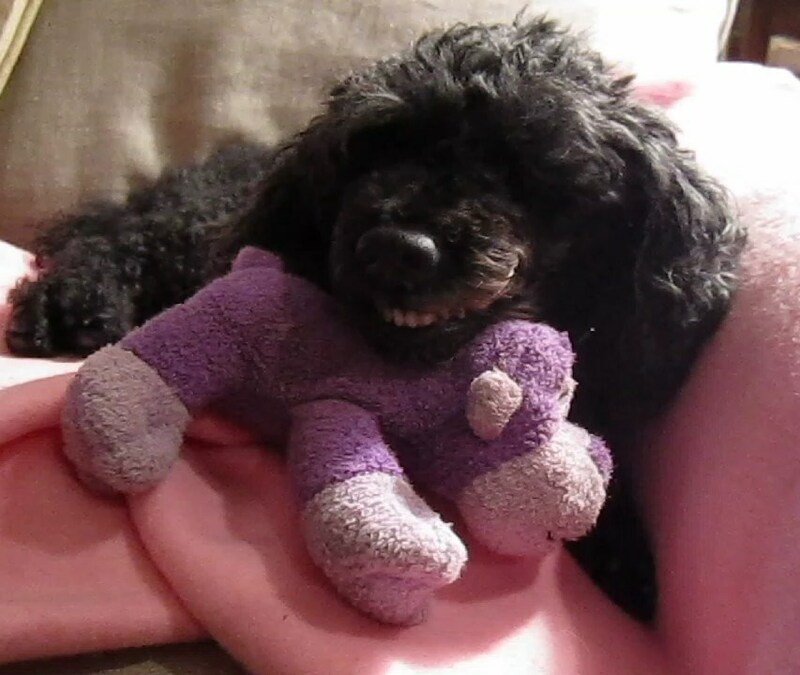 To me, it looks like she is just smiling. 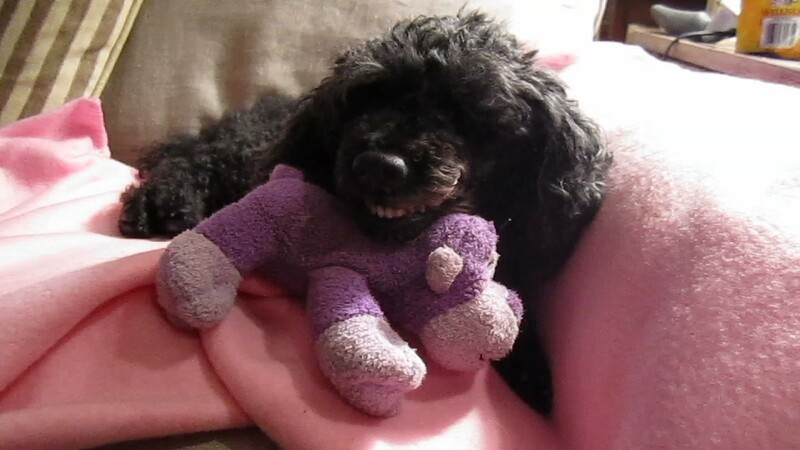 Maybe Mom thinks she shouldn't show her teeth until she has her dental work and gets them cleaned. I looked in the mirror the other day and saw that not only do I need to lose some pounds, but I am getting a bit flabby. So it got me to thinking that I should lift weights. I went to look for my Dad's weights to borrow. I have often watched him working out, so I figured I knew what to do. What I didn't consider is that I cant lift them since I don't have thumbs. So I have asked for wrist and ankle weights for my birthday. I figure I will just have to do Pilates until my birthday in September. Today commemorates the life of Dr. Martin Luther King, Jr., an iconic leader in the advancement of civil rights in the U.S. and around the world. On April 4, 1968 when visiting Memphis, he was assassinated on the balcony of his room at the Lorraine Motel (now the National Civil Rights Museum). 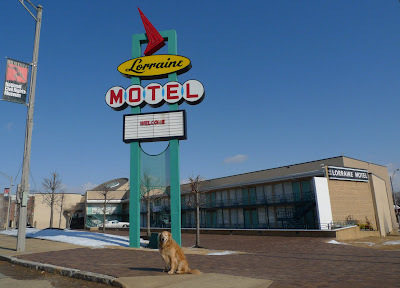 So I went to the Lorraine Motel to pay my tribute and thank Dr. King for his legacy of hope and inspiration. The other night I had this amazing dream. I put my ball down on the floor and it kept growing and growing and growing. 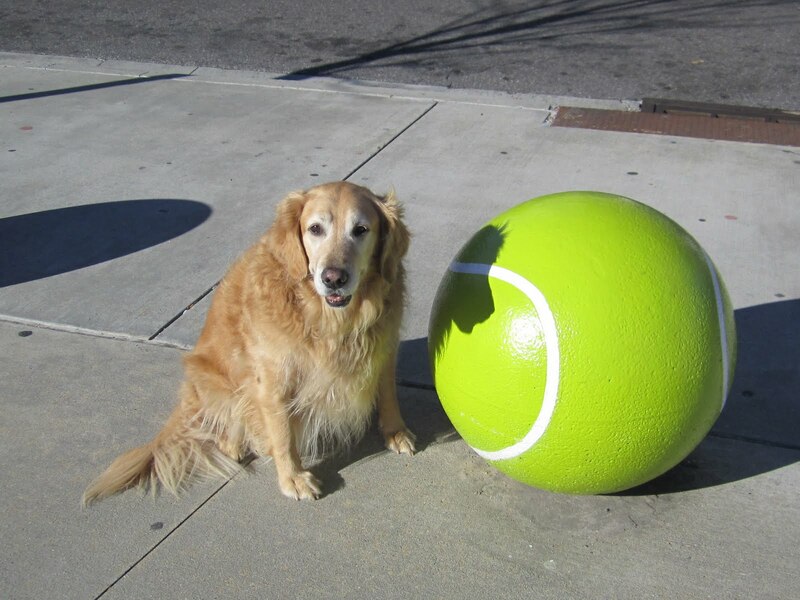 It became the biggest tennis ball ever. I just stared at it in awe. I don't remember the rest of the dream. I hate that about dreams. Anyway, yesterday on a walk, there it was! The giant tennis ball! My dream came true! How cool! The other day, we went by the Memphis Welcome Center down by the river. I wanted to go inside to see the big Elvis statue, but I wasnt allowed. So I walked around outside. And there was a giant welcome egg! I kept on looking, but I couldnt find any welcome bacon. I think snow is pretty cool. Yes, of course I love to run and play in the snow. But a really great thing about snow is I can eat it. And I can eat as much as I want. This is a great discovery for me because I love to eat. However, I am told that Memphis does not get snow very frequently, so unfortunately, snow is not an answer to my weight problem. What else can I eat infinite amounts of? While there are a lot of cool things about the world of snow, it can be quite challenging. Retrieving for instance. When Mom threw me the ball I couldn't find it. I saw the ball go up in the air and come down. But when I ran to fetch it, it wasn't there! I searched on the snow and no sign of yellow anywhere. So next I needed to look under the snow. Yup. There it was! How did it get there? When it snowed, everyone told me to make snow angels, or in my case, Bear angels. I did that which was fun. 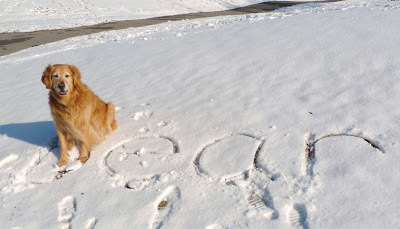 But I thought of another way to make my mark in the snow. Why not just leave my name in it? Maybe I started a new trend...snow graffiti! Yesterday, I had my first snow day in Memphis. We went to the golf course, which was white instead of green. We had the best time ever. Everyone was off leash, even Rosy! I rolled, , played with Fuzz, chased and caught my tail and then chased Rosy, but didn't catch her. We love being SnowDogs. I wish it would snow all the time in Memphis. But that would mean I would need to buy a snow machine. Um. I wonder how much that would cost. Last night after Dad, Fuzz and Rosy went to sleep, Mom and I snuck out to play in my first snowfall. 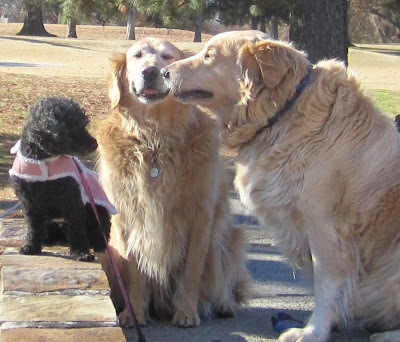 I chased after my ball with my nose and my ball kept rolling getting whiter and whiter. Well I thought, why should my ball have all the fun? So I rolled and rolled and kept getting white snow all over me. My Mom said we needed to go inside. I told her she looked like a SnowMom. So I went to sleep happy and dreamed of snowdogs. My ball dreamed of snowballs. I never saw snowfall. So I was SO excited yesterday cause it was supposed to start snowing at 3pm. So at precisely 3pm, I went upstairs and waited by the window. My ball waited too since it never saw snowfall either. We waited and waited. No snow. Then it was time for my dinner. So I went downstairs to eat, looking out the window while chewing. But still no snow. And then finally, at 6:30 my Mom & Dad said its snowing! So I took my ball over to the window so we could watch it together. Wow! Yes, snow is very beautiful, but it is rather impolite. It should have let me know it was going to be late. It was such a pretty day out and we were having such a loveley walk. I thought it would be nice if we took a moment and reflected on the beautiful day. I thought about yoga, but Fuzz and Rosy were not up for that. So I told them to just sit and meditate. I thought about the clear blue sky, the tall evergreen trees, the wonderful crunch of rolling on the leaves and expansive peaceful open space. Fuzz thought about hamburgers. Rosy thought we were crazy. 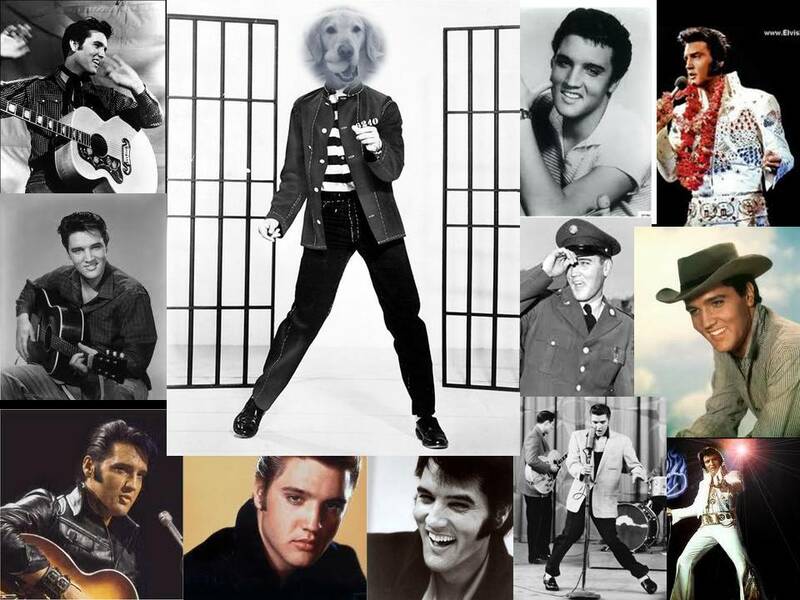 Today is Elvis Presley Day in Memphis and there are big celebrations going on. And since I am a Memphian now, I too celebrate the King's birthday. He was way cool. I would love to learn to rock and roll like him. Do ya think I could do those moves? Do I need to go to a Jailhouse? Or maybe this Hound Dog needs some Blue Suede Shoes. When BunnyBell visited, Mom bought her a dog bed. But BunnyBell preferred the couch. So the dog bed went unused and remained in the kitchen. Well yesterday I decided why waste a dog bed? So I brought the bed into the living room. It is actually very comfortable. I also took Bear's iBone, cause he hardly uses it. No reason to let that go to waste either. The other day Mom took me on a walk and we passed this big stadium. She told me it was the Liberty Bowl where the University of Memphis Tigers play football as well as have an annual special football game. But that means that very often it is just empty, So it got me to thinking. Since it is called the Liberty Bowl it would make a good off leash dog park for times when they aren't playing football. On those days dogs could go and run free and feel liberated. I wonder who I should contact to suggest this. Today is my Mom's birthday. I am not allowed to tell you how old she is. Dad was going to take her to a fancy schmancy restaurant. But she said she would rather celebrate at home with us! So I am throwing Mom a pizza party. Rosy picked out the table decorations. I got matching cupcakes. Fuzz ordered the pizza too early so we had to eat it. So we will order another pizza tonight. But Shhhhh. Don't say anything. It's a surprise party! I was out on my walk yesterday and saw so many Christmas trees laying out in the street. They were all naked, no more pretty decorations. I felt bad for them. So I went over to each one I passed and thanked them for their Christmas service. I hope they are all going to be happy in Christmas tree heaven. On this date 61 years ago, a recording studio was opened by rock pioneer Sam Phillips right here on Union Avenue in Memphis. Sun Studio http://www.sunstudio.com/ became the birthplace of Rock and Roll. 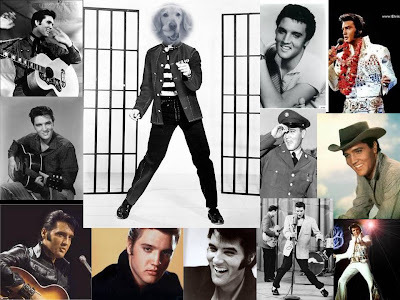 So many famous musicians recorded there including Elvis Presley. Yes! Elvis! Sun Records released his first recording. You can go today and do your own recording. I really wish dogs were allowed in to do that. Maybe I would be discovered. The next big talent from Sun Studio...Rockin' Bear. My new years resolution is to try to eat less treats. But to really lose weight, I have heard you also need to exercise. Well, we have a treadmill so I thought I should try it out. But when Mom was about to turn it on, I got scared and got off. And then I thought of another New Year's resolution. Instead of the treadmill, I will try to walk faster on my walks to burn more calories. Today is the first day of the new year 2011. I think I am supposed to announce my new year's resolution today. Well, I still have that weight I need to lose. So my resolution for 2011 is to refuse 50% of treats I am offered. So if I am given two treats I can only have one. That does sound a bit harsh. I will just have to ask to be offered more. That way my new year's resolution is more realistic.